Angela Switzer, left, and Denise Brecount spread mulch donated by Jason Hoelscher in preparation for the Home & Garden Tour. ST. PARIS – Village workers and volunteers are making preparations for the June 23-24 Historic Home & Garden Tour, a project of the Champaign County Preservation Alliance. 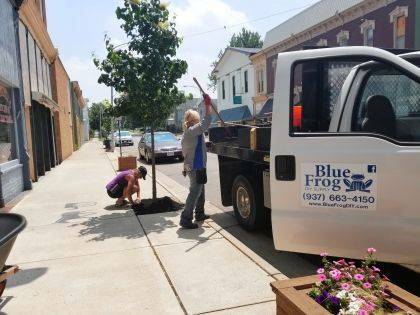 Street Department employees Jim Copes and Jack McGill put heavy barrel planters in place along the main streets so volunteers from Graham FFA and the village could plant flowers. Volunteers also arranged for mulch to be donated by Jason Hoelscher, Blue Frog DIY Supply, and then they all showed up to work together spreading the mulch. The Our Town Saint Paris Business Association met May 28 with citizens and business owners to collaborate about various volunteer opportunities, including continuing to prepare for the 26th annual tour, which will be held this year in St. Paris. “Everyone in the village is excited as we prepare to host hundreds of visitors for this event. We have some beautiful historic homes in St. Paris,” said Mayor Brenda Cook. Tour hours will be 11 a.m. to 5 p.m. Saturday, June 23, and Sunday, June 24. For more information, visit CCPAURBANAOHIO.COM. Submitted by Our Town St. Paris Business Assn.